Fair winds and good fortune have been our companion since slipping the lines at No 9 Waish Bay last November. Owing to the late decision to join the First Fleet Re-Enactment, we sailed short-handed to Fremantle. Mother Nature gave us a light northerly which strengthened as the day progressed, allowing us to regain our sea-legs after those many months spent shore-bound in Sydney. It was strange to be rounding Cape Leewin again. After our past three experiences we vowed never to sail that stretch of water again. As we approached our berth in Fremantle, the vessels of the First Fleet manned their yards and gave us three hearty cheers of welcome. The remainder of that day was spent catching up with old friends and former ship-mates swapping yarns of our adventures since last we sailed together. On Boxing Day the ships of the First Fleet set forth from Fremantle. Deep in everybody's mind was the fear that we may suffer the same fate of the Tall Ships and experience head winds and calms as did they on their passage eastward. A sigh of relief from the crew of 87 as our track showed us clear of Cape Leewin. A cold front and a series of blows carried Eve of the Wind eastward with some superb sailing. We experienced the joy which sailors of bygone days knew well - to be in company with other sailing ships at sea. A rare sight indeed. No doubt everyone in Australia and in fact millions around the world, must have shared in the triumphant arrival of the second fleet in Botany Bay and later in the spectacular welcome which greeted the fleet as the ships sailed to the anchorage in Farm Cove. An unforgettable experience. As the First Fleet proceeded to Darling Harbour, Eye of the Wind made her way to Wollongong for the long awaited survey by the U.K. Department of Transport surveyor, flown out at great expense. (Business Class) We must admit that after all the trials and tribulations of our dealings with the department with regard to stability, we somehow feared that the same negative attitude would persist during this important survey which was so vital for our survival. After four days Eye of the Wind slipped back into the water with a shiny red bottom and a certificate valid for four years to operate as a Sail Training Vessel. This achievement was made possible by the loyal support of crew and friends. The owners are indebted to the crew of 87 who joined the ship to see the Pacific islands and enjoy the sunshine, but instead spent so long in the dim dark depths off Pier 9. 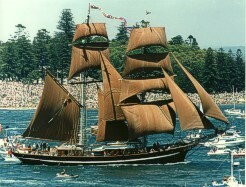 Setting forth from Darling Harbour, Eye of the Wind flew the Commodore's pennant from the main-mast, thus becoming the flagship of the First Fleet. As the ships cleared the heads, a south westerly front initiated the green hands and sent us to sea with a bone between our teeth. Quite incredible that favourable winds and dry days prevailed on the passages to Melbourne, Portland, Adelaide and Newcastle. Added to this we had the pleasure of renewing the acquaintance of many old friends who were to greet us at these ports together with enthusiastic crowds, particularly in smaller ports. As we entered the Roaring Forties we experienced some heavy weather. Then later as we approached Tasmania the early morning mist hung low over the rugged mountains surrounding Port Davey. It cleared to give us three magical days in Port Davey and Bathurst Harbour, enabling at least eighty trainees, on one day alone, to climb Mount Rugby. Should this be entered in the Guiness Book of Records? Fisherman friends joined us to share the harvest of the sea with a barbeque on the beach at Bramble Cove, where we feasted on crayfish, abalone and mussels. Delicious. As we write, Seal Rocks lie abeam to port. The fleet are scattered over an area of some twenty miles, playing hide and seek in the rain squalls. Ahead lies Sanctuary Cove and the final leg of the First Fleet Re-Enactment Bicentennial voyages to Sydney, where we are due to arrive at the end of this month. Within a week of our arrival in Sydney the Pacific voyages will commence. LIAM WALSH continued his journey to Silicone Valley, California, a year later than was planned. Rumour has it that Liam and TAMS MORRIS (who is now back in Tasmania with her horses) are about to be spliced. Schoonerman WAYNE CHIMENTI and his wife NICOLE completed the maiden voyage of the brigantine Cory Cramer between Balboa and St. Thomas, US Virgin Islands. LINDA and TIM NOSSITER and their son JESS, after keeping the light burning at Maatsuyker Island, have returned to their home overlooking D'Entrecasteau Channel, where Tim has become Master of the Marine Centre vessel. PAULINE WRIGHT, having survived the perils of an overland trip through Africa, is bound for Brazil by yacht. Adventurous LYNNE DAVIES, with boyfriend Tim, has joined Wayne Moran (ex Taipan) in Hong Kong aboard the recently launched sailing junk, Cocachin, which is due to sail from Shanghai in October to retrace the return voyage of Marco Polo to Venice. Many earlier Windies were surprised to meet some of the present crew in the grey dawn light of the Barossa valley as the competitors of the Bicentennial Balloon Challenge took to the air. ROBIN HICKS, who has kept the rigging trim and taut for the past fifteen months, has returned to Western Australia to commence making blocks in prep-aration for the rigging of the proposed Alan Bond project replica of the barque Endeavour. BRYCE BATHE and Dan PARROTT sailed Solway Lass into Sydney on Australia Day. Bryce now has his Master Class IV and Dan is studying for the same certificate. A great night with some good old barn dancing was had when we joined RICK OFFICER to celebrate his 21st birthday at his mother's home in Victoria. Also at the party was GARY WILSON, Grolly to most of you, who is now 2nd Mate aboard Alma Doepel. SALLY DRURY is attending Japanese studies at university in Bathurst, where she heads the Debating Society and also wields a mean foil at the Fencing Club. It was a great pleasure to have LIZ TOOHEY and JONOTHAN HICKLING married aboard at Darling Harbour in February. Still quite a few vacancies left on most of the Pacific voyages. Don't miss out. BOOK NOW. Full details of the long awaited voyage to PITCAIRN ISLAND are now available from our office. Do not miss out on this unique voyage which coincides with the bicentenary of the mutineers arrival at the island.